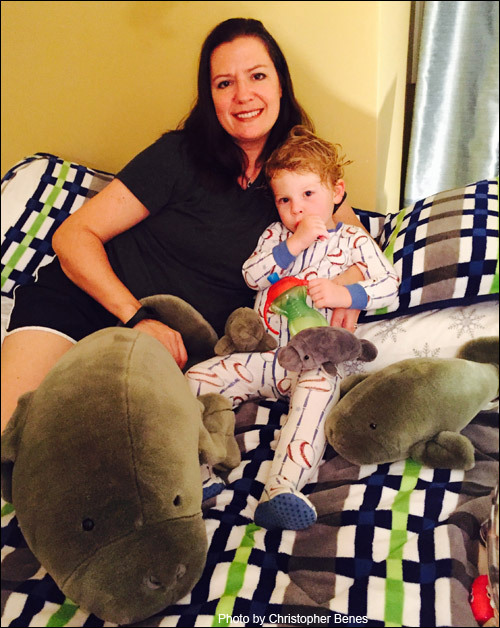 Krista with son, Augustus, and his many plush manatee pals. “We have already educated him about manatees,” says Krista. Note: A high resolution jpeg (300 dpi) of a manatee image, as well as a photo of Krista Benes, are available upon request. Celebrate mom or anyone who’s been like a mom with a thoughtful and unexpected gift for Mother’s Day. Adopt-A-Manatee® from Save the Manatee Club, who will send an adoption certificate with a color photo of a real, living manatee, a biography, and a membership handbook. A newsletter subscription is also included, where members can read about and follow their manatee’s progress. For $35 or more, gift recipients also get a individually handcrafted manatee heart ornament with every gift adoption (supplies are limited). Funds from the adoption program go toward efforts to help protect manatees and their habitat. The Club offers 34 manatees for “adoption,” and favorites are selected by visiting the Club’s website. Whether the choice is Gator or Electra– two of the newest additions to the program – or Rocket, Phyllis, Deep Dent, or Doc, adopting a manatee helps them all. Click the following link to Adopt-A-Manatee® online now. In 1981, Save the Manatee Club, a nonprofit advocacy group, was formed by singer/songwriter Jimmy Buffett and former Florida Governor and U.S. Senator Bob Graham to protect manatees for future generations. Collisions with boats remain the largest known cause of human-related manatee deaths, whether from the hull’s impact or from the sharp blades of a boat’s propeller. Most living manatees bear the scars from these collisions, and researchers identify individual manatees using scar patterns. Cold stress, toxic algae blooms, ingestion of fish hooks and other human debris, and entanglement in crab trap and monofilament line also take a heavy toll on the manatees. For more information about manatees and adopting for Mother’s Day, visit Save the Manatee Club’s web site, or call 1-800-432-JOIN (5646). Also, visit The Manatee Store, the Club’s online shopping center, for more appealing gift ideas at shopsavethemanatee.org.